On Monday March 7 we traveled from Paris to Saint-Malo. Got up early and had our breakfast at the Hotel Opera Plaza. It consisted of yogurt, breads, butter, jams, orange juice, coffee and fruit. Same breakfast we had each day in Paris. The croissants, baguettes, chocolate bread and raisin bread were delicious. Paid our hotel bill and headed out to get a taxi. It took all of 30 seconds to get a taxi for Gare Montparnasse which is on the other side of the River Seine. It was a nice ride of about 20 minutes through the streets of Paris. The taxi driver was very expert at darting and dodging through traffic. We arrived in plenty of time. Purchased a ham and cheese sandwich and an Orangina to have for lunch on the train. The train ride was good. We had first class tickets and enjoyed the spacious seats. After lunch and a 3 hour trip we arrived at the Saint-Malo train station. We were met at the platform by our friend Jean-Louis Heleu. It was very good to see him again after almost 18 months away. Of course he took us to see the ocean before heading to the apartment. It is always good to see the ocean. So intriguing and mysterious. Our apartment is in the Intra-Muros (IM) which is the old walled city part of Saint-Malo. The road in front of our apartment building is quite a mess. The water utility company is replacing pipes in much of the Intra-Muros. But it was good to open the door to the building, climb to the 3rd floor and open our apartment door for the first time in 16 month. Jean-Louis had turned the heat on in the apartment a couple of weeks ago so it was nicely warm. So we spent the rest of the day unpacking and getting things going. Everything was in good shape. I even got the water heater working. It always is the most difficult appliance we have. The gas seems to take its time getting to the heater after being unused for such a long time. That evening we had pasta for dinner. Sandy found some Barilla Pesto sauce in the cupboard. That and Barilla Pipe Regatta pasta made for a delicious meal. Especially with our fresh baguette of bread. We were unable to travel to France in 2015. But this year, 2016, we are returning to France. On Wednesday March 2, we drove from our home in Winona Minnesota to Minneapolis-St.Paul Airport. We took a Delta Airlines flight to Detroit. There we took an Air France flight to Paris Charles De Gaulle (CDG) airport arriving around noon on Thursday March 3. From CDG we took the regional train (RER) to the Gard Du Nord train station. 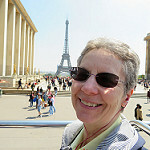 From Gare du Nord, we walked to the Hotel Plaza Opera which was an excellent hotel with breakfast included in the price. Unfortunately we did not walk their directly. We, actually Phil, went the wrong way, but we got there plus some extra exercise. That evening we walked to the Galeries Layafette. It was our first visit to the big department store and the view of Paris from the terrace top was amazing. That evening we ate at Pizzeria Abradavio. Sandy had margherita pizza and I had lasagna boulognese. On Friday March 4 we visited Notre Dame de Paris. We used audio tours which were very good. The cost of the audio tour was 5€ which also included access to the Treasury which is usually an extra 4€ cost. We got there early which was great. By the time we left, it was getting very crowded. We took the bus to the Picpus Cemetery (Cimetière de Picpus). It is a private cemetery with quite a history. The Marquis de Lafayette is buried there. He was a General in the French Army and the American Revolutionary War Army. To this day his grave is marked by an American flag. We didn’t realize the cemetery did not open until 14:00 so we had a nice lunch at a local restaurant, Bistro du 5. It was great food and we really enjoyed talking with the proprietor. That evening we ate at Cafe Monaco. I had steak and fries and Sandy had roasted chicken. It was very good. On Saturday March 5 we visited the Musee D’Orsay. It is in a former railroad station which has been restored. The movie “Hugo” was filmed inside. It is a beautiful building. This in contrast to the Louvre has more modern attractions and is easier to navigate. We used audio tours which were very good. That evening we ate at Le Baron. It is a very pleasant restaurant. We had a delicious meal. We both had stuffed breast of chicken with eggplant. Sunday March 6 was Sandy’s birthday! The hotel gave her a half bottle of champagne and a box of chocolates as a gift. We had a lot of issues getting to Victor Hugo’s house in Place Voges. The Paris Half Marathon was held that morning, so the bus schedules and routes were disrupted. We made it eventually, but it took twice as long as we had planned. We took multiple buses and the metro in the process. Victor Hugo’s house was very interesting. We used the audio tour process again and it was worthwhile. We plan to voyage to the Channel Island of Guernsey this summer and visit Victor Hugo’s home on the island. Afterwards we took the bus to the Eiffel Tower. We took a picture of ourselves with the Eiffel Tower in the background. That evening we ate at the Professore Restaurant. It was a really nice place and we had a great meal. Sandy had artichoke lasagna and I had pork loin with peppers, onions and potatoes. Click on this link to see our pictures from Paris!